This is a very simple & quick recipe which just saves your efforts to roast the besan. Morover it is roasted evenly only in 5-7 minutes. Try this recipe which is favourite of everyone. Add desi ghee in a big microwavable bowl . Keep the bowl in microwave oven for 1 min. or till it dissolves. Add besan & rava in the ghee. Again microwave the mixture for 3 min. ( full power in my microwave oven ) without covering. Take the bowl out of microwave oven, stir the mixture properly & repeat the procedure for 3-4 times. After every one minute stir the mixture very well. It will take about 5-7 minutes to roast the besan. You can smell the nice aroma when it is roasted nicely. Add sugar, dry fruits & elaichi powder. 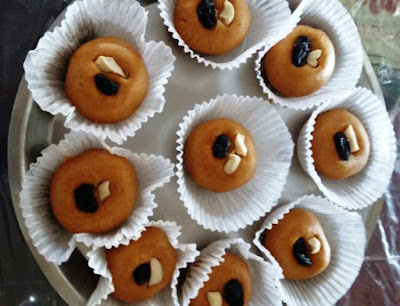 Note : If you find the mixture dry then add 2-3 tsp warm milk & microwave for a minute & then roll the laddus. 6 tsp ghee kam pad gya isliye main andajese aur dala wo 6tbsp hai kya? How many laddus would it make with 2 cups of Besan?